Today, as the popular Kyrgyz writer Chingiz Aitmatov is no longer with us, we take his books from the shelf and re-read them, we reconsider the films which have been made on the basis of his works, and we think: “Why do directors show a constant, steady interest in a writer's creative work?”—maybe because strong, outstanding heroes, who are able to resist evil, injustice, and violence, stand at the center of Aitmatov's works. However, these characters are far from powerful, as we see for example in Kemel, the protagonist of the film Heat (Znoi, 1963) by Larisa Shepitko, or in Temür from the new film, Tengri. Recently, the premiere of this French-German-Kyrgyz production took place in Bishkek. The film is made by a director from France, Marie Jaoul de Poncheville, who does not conceal that her film is inspired by the story “Jamilia.” De Poncheville adores the Kyrgyz classics, and she dedicated Tengri. 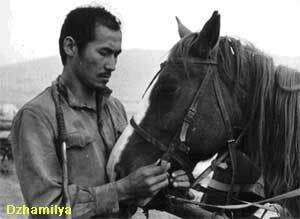 Blue Heavens to the memory of the Kyrgyz-Russian writer Chingiz Torekulovich Aitmatov (12 December 1928-10 June 2008). But we shall return to this film a little later; first, we shall look at two earlier screen versions of the story. Directors have turned repeatedly to the story “Jamilia”: in 1969 the Russian director Irina Poplavskaia; in 1993 the German Monica Teuber. Our compatriot Dinara Asanova had dreamt of adapting “Jamilia” and even developed a director's script with a magnificent storyboard. Unfortunately, she did not live long enough to make this film. Teuber managed to involve the well-known American theater and film actor Fahrid Murray Abraham, familiar to us from the screen through his roles of Salieri in the film Peter Shaffer's Amadeus (1984), which earned him an Oscar. In Teuber's Jamila Abraham appeared in the role of the adult Seit, who—by the director's whim—received the name Frolov. But, as it turned out during the filming, this was not the only whim of the director: for the role of Daniyar she chose the blond Jason Connery, taking literally the author's comment that Daniyar is a stranger, an alien in the community. The part of Jamila was played by a French actress of Vietnamese origin, Linh Pham. A more thorough preparation would probably have facilitated deeper immersion into the role, and she could become an ideal Jamila. Aitmatov writes: “Jamilia was good-looking: slender, portly , with straight and wiry hair plaited into two tight braids.” Linh Pham is indeed a very beautiful woman, but for the creation of the complex role of Jamilia external factors are obviously not enough. In the film Dzhamilya (1969) by Irina Poplavskaia the leading role was performed by Natalia Arinbasarova. It is clear that her treatment of “Jamilia” was much closer to the literary prototype than the image created by Monica Teuber and Linh Pham. Though Arinbasarova is not quite as beautiful as Linh Pham, she was nevertheless able to express much more concisely the internal freedom and liberation of Jamilia. Further on Aitmatov writes : “Her character contained some male features, something sharp, and at times even rude. Jamilia also worked energetically, with a man's grip.” The quite small, but not exactly slender Arinbasarova precisely set all these accents and behaves natural and relaxed, as if the feelings of her heroine had become her own. Linh Pham, on the other hand, declares her personal independence from Jamilia: suffice it to remember an episode in which Seit reads Sadyk's letter from the front. The heroine is indignant of Sadyk's indifferent attitude towards her, and angrily expresses herself on this matter. Arinbasarova's Jamilia experiences the whole situation almost latently, and the change of her inner feelings occurs gradually: her radiant eyes of the beginning of the letter transform and offer a dull gaze in the end. Needless to say, the Kyrgyz audiences did not accept Monica Teuber's Jamila. Teuber had a unique chance to draw general attention: adapting, in the early 1990s (during a wave of feminism), a literary work of the late 1950s about a woman who had the potential to free herself, she had to place the stresses according to the taste of the new era. From the late 1980s until the beginnings of the 1990s the unchained female rebel of the 1950s was transformed into the independent image of a woman firmly standing on her feet, with dreams that she knew how to make them come true. Monica Teuber, subtly catching the topicality of the story of Jamilia's internal liberation, unfortunately could not make her a modern character. Fifteen years later the French director Marie Jaoul de Poncheville transposed the plot of Aitmatov's immortal story in accordance with the realities of modern life, keeping nevertheless the basic conceptual component of the cult literary work. 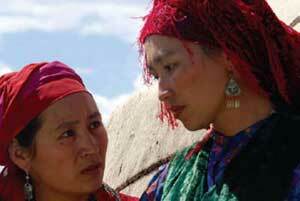 The International Film Festival “Kyrgyzstan-France-Germany” in Bishkek (28-29 June 2008) saw the premiere of the French-German-Kyrgyz film Tengri by the French director Marie Jaoul de Poncheville. The film begins with a short prologue. France. Night. A strip of the ocean coast. A storm. Two people of European appearance grab an Asian man, throw him onto the ground and hold him down firmly; a while later he is deported from the country. Blackout. 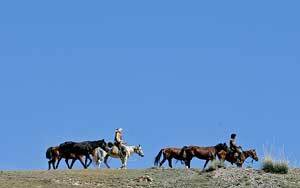 The title follows: Tengri. Blue Heavens , accompanied by a powerful Asian voice which is born in the heart of a singer and which passes through his throat freely to soar in the heavenly heights of Asia. The voice proudly resounds above the open native land of the deported Asian. A sharp-sighted, bold eagle guards the hero, cutting across the scarce cloudy waves of Tengri. The exhausted man nevertheless walks confidently across the thoroughfare, lightly and simply mounts a lorry. 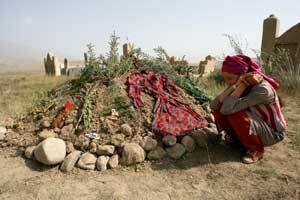 The local people unceremoniously explain how to reach the jailoo (pasture) Ak-Zhuz, where a certain Taras lives. The downtrodden hero, who has aged early, tries to choose his steps carefully in order not to trample down the grass, because he knows that it is precious sustenance for the livestock that grazes on the jailoo in the summer. The hero is called Temür. It transpires that his father, Taras, died. Someone quietly asks: “And you are probably Jamilia's son?”—“Yes”, the newcomer answers quietly. The native land accepts the prodigal son, but the fellow countrymen don't. Only the beautiful Amira (Albina Imasheva) and her elder sister Ulzhan (Taalaikan Abazova) with their brother Taibom show an interest in Temür (Ilimbek Kalmuratov). The image of Amira is similar to Aitmatov's Jamilia, and the director emphasizes that the plot is inspired by the love story of Daniyar and Jamilia. In her work, Marie Jaoul de Poncheville always raises the question of female vulnerability in a patriarchal world. It is less important where the action of her films takes place—in Europe or in Asia. In France too, according to the director, the male world reigns and women have no easy game. Let us remember that Jamilia is a typical heroine in Aitmatov's work, attracting the attention of Louis Aragon and receiving popular acclaim in France because it corresponded to the 1950s image of femininity in the West. I n French cinema of the time there emerged (and later confirmed itself) the type of young women who place the naturalness of feelings and the authenticity of impulses above everything else. This type of woman did not want to conform to standard norms of behavior, thus highlighting the break between generations, the vague and informal revolt of the young generation against bourgeois values. When in the beginning of the 1960s the literary critic Georg Gachev started his first reading of the story “Jamilia”, he knew that it had already been translated into French by Aragon. Therefore Gachev concluded that “Jamilia” “stands on the level of modern literary thought and somehow enriches it.” Having read the story, Gachev came to the conclusion that “the patriarchal family relations of the Kyrgyz people developed during the nomadic epoch, and apparently smoothly spilled over into socialist relationships. But the immutability of the patriarchal condition seemed already undermined somewhere deep down. 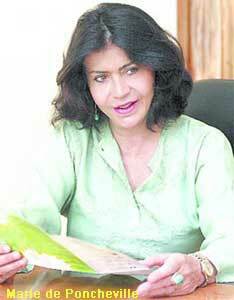 This undermining of old norms and ideas about duty is shown in the character of Jamilia. It is obvious that she behaves somehow strangely, idiosyncratically, getting away with a lot of things that are not accepted, whilst there is no reason to condemn her”. 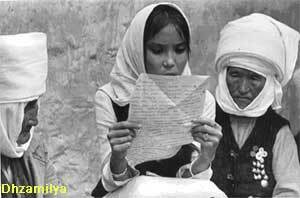 The people also condemn Amira, the heroine of the epoch of change. Amira is a woman who is free from prejudices, who is driven by a desire to find out what love is. Weak and useless men who are brave enough to make a pass at her only after a few shots of vodka condemn her. They are so brave that they can beat a woman to death, as does the drunken Askar to his wife Ulzhan. The screen heroes also find another way of overcoming the deficit of courage in themselves: Amira's husband Shamshi, a mujaheddin, pretends to be a devout Muslim and regularly disappears to the so-called “hot spots” in the south to earn money. Shamshi can only fight, not create. Thus for the most part he appears backward when compared with Amira. He knows neither feelings nor suffering, nor does he understand the languishing of his beautiful wife. Usually Shamshi returns home for a short holiday to have fun—not in the marital bed, but on a binge with his buddies. Here Temür comes to the jailoo: a man from nowhere, without a penny in his pocket. He lodges in a hut on the outskirts of the nomad camp. The only person with whom the newcomer finds a common language is a former Afghan soldier, a rude Russian muzhik with a kind heart who has forever got stuck in this beautiful Asian country and sells the metal remnants of the former Soviet empire to the Chinese. Amira is not worried about Temür being a loser in life. Although her chosen man is materially poor, she senses the depth of his inner life: he is spiritually rich. With him she can experience complete happiness in an all-embracing love. Amira runs away with him. On the road it emerges that Temür in incapable even of killing a hare with a sling-shot, of fishing, of shooting a bird, of feeding the beloved but starving Amira. Temür does not know where he is leading her and what the next day will bring. He does not plan life, but simply moves forward, towards the west, which has already expelled him once before. Temür has not found himself in the native pastures. Not having mapped out his life compels Temür to subdue to circumstance and leave the native land yet again. Temür cannot stand up against Amira's husband with his gang of insurgents; he is basically not fit for life, he is a dreamer, and needs a strong woman to support him. In the beginning I mentioned the eagle on the high, Asian skies which guards Temür in his native land. The eagle appears twice more in the field of vision: the second time, when Amira visits Ulzhan's tomb and tries to set up a memorial stone; Temür helps her, and their relationship begins. For the third time the eagle appears towards the end, when it signals to the heroes that, having overcome all conceivable and inconceivable obstacles, they have reached a foreign land. The film closes with this new hope for future happiness. Marie de Poncheville wanted to show the Kyrgyz nature: “Let everybody in the world see what a beautiful country Amira and Temür inhabit.” Yes, our landscapes are magnificent and picturesque, but amidst this beauty de Poncheville's heroes cannot find happiness: they leave to find it in a foreign land. 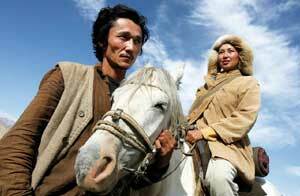 Tengri is an audience film. The citizens of Bishkek received it well on the whole. True, some viewers noted an (in their opinion) obvious minus—the film's musical score: “Overtone singing is not characteristic of the Kyrgyz people! We have our own remarkable folk music which the director should have used!”, indignantly claimed the supporters of national traditions. It is strange that these critics don't accept the director's decision to use as musical leitmotif the overtone singing that is traditional for all those peoples who adhere to Tengriism, in combination with the theme of the “cavalcade”, embodying the eternal break-escape-exodus of Asians from the depths, heights and distances of their native land to new, foreign territories and their constant return to the native land under the high skies. Overall, the plot is accompanied by a range of songs, which did not give rise to unfavorable criticism. The actresses Albina Imasheva and Taalaikan Abazova sing, from their hearts, lyrical and fervent Kyrgyz songs. The well-known actor and bard Nikolai Marusich performs his works. The actor Tabaldy Aktanov recites a short fragment from the epos “Manas”, and his young partner Aibek Midin Ulu attempts to perform the same fragment in the style of rap. All this is recorded live in the film, since the sound was recorded on location and not in a studio. Bewilderment was caused only by the droning Ukrainian song, which the director used for the episode of the flight of the Kyrgyz lovers Amira and Temür . Many people reckon that the film is too long, and that the second half is flawed with long takes of the mountain-scapes, while the infinite pursuit of the fleeing lovers is unreasonable and should have been shortened. Others did not accept the film at all. Furthermore, there were people who discussed nuances in behavior, actions and manners. For example, they commented on the incorrect drinking of koumiss during the first meeting of Amira and Temür, suggesting that it is inappropriate for the national drink to run down the chins. This grumbling reminded me of the indignation expressed by spectators in the past, when they could not accept a movie star in the role of a simple worker, as she—lathered in soap—ran into the house to embrace a dear friend. 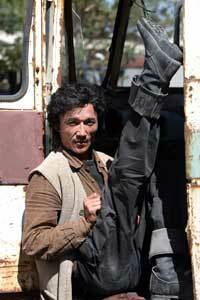 In the column of the film's minuses I noted the obviously un-Kyrgyz kiss of the lovers in the first scene. They kiss performatively, roughly latching onto the partner's mouth, so their kiss looks unnatural, while the whole scene lacks an aesthetic concept. The Kyrgyz people are rather chaste. Another big minus for me are the inadmissible daytime shots for nocturnal scenes with the use of a dark blue filter. The screen instantly shows the hackwork of the camera crew. The negligent editing that leaves traces of the cuts in the first half of the film also cut the viewer's eyes. Many spectators were bewildered by the presence in one of the supporting roles (Shashmi's mother) of the French actress of Vietnamese origin Hélène Patarot. As Marie de Poncheville explained to me, Patarot's character is that of a Chinese woman, who married a Kyrgyz man in her youth. Therefore the actress's strong accent is justified, when—in line with her part—she speaks Kyrgyz. Another nuance is obvious here: in order to get financial support in France for the making of a film in another country, it is necessary—among may other requirements—to cast at least one actor who is a French citizen, and incorporate a French theme into the plot. After the film's release the Kyrgyz audiences discovered a new name: Albina Imasheva. Although, Albina is a re-discovery: as a little girl she appeared in the well-known film by Aktan Arym-Kubat (Abdykalykov), Beshkempir—The Adopted Son (Beshkempir, 1998); here she played Aynura, the teenage girl with whom the main hero is in love. Imasheva also starred in the television film of That One (Toi) by Asan Aitikeev. She works at the Kyrgyz National Academic Drama Theatre. Albina's partner Ilimbek Kalmuratov graduated in 2001 from the Shchepkin Theatre School at Moscow's Maly Theatre. He works at the theatre “Uchur” in Bishkek. 1] See, for example, the article about Brigitte Bardot who created this role in French cinema, in the collection of essays Actors of Foreign Cinema (1964). 2] Georgii Gachev, Chingiz Aitmatov. Frunze: Izdatel'stvo Kyrghyzstan, 1988. The text from the story “Jamilia” is cited from Chingiz Aitmatov, Materinskoe pole, Frunze: Izdatel'stvo Kyrghyzstan, 1964. Tengri – Synopsis. Temür, a thirty-year-old Kazakh, has given up hope of ever earning a living as a fisherman on the Aral Sea. The dried out lake has shrunk to 10% of its size and turned into a salty brine that no fish can live in. 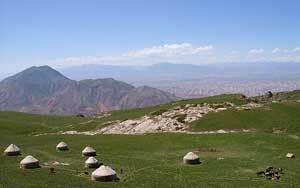 So he returns to his native village in the Kyrghyz Mountains, Ail. It is spring and Temür is full of hope for a fresh start. But life in the village of his youth is not what he expected it to be: There are no men of his age left in the village, and the older ones are turning to a more fundamentalist version of Islam. Then Temür meets a young Kyrgyz girl, Amira, who is lonely and waiting for the return of her mujahideen husband, who has gone off to fight. Temür starts spending time with Amira and her brother-in-law Taib. When Temür and Amira fall in love with each other, their only recourse is to run away... A love story set in the heart of Central Asia. Production: Mosfilm, 1969, b/w and col.
Production: Triangel Film (Germany), Kirgizfilm, 1993, col. Cast: Albina Imasheva, Ilimbek Kamuratov, Nikolai Marusich, Taalaikan Abazova, Hélène Patarot, Tabaldy Aktanov, Nusurman Odurakaev, Askhat Sulaimanov, Aibek Midin Uulu.